Aloha! How are you guys doing? 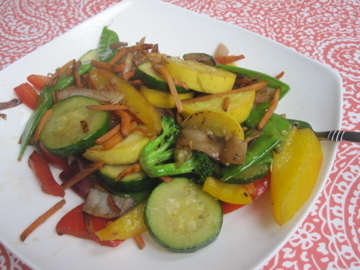 Then my body wanted vegetables, so I took an entire package of grilling veggies and stir-fried them. I didn’t grill them because I don’t know how to use our grill. And I didn’t really feel like learning. The veggies got a dose of Bragg’s Liquid Aminos and tasted heavenly. While I was running errands I found a new frozen yogurt place right next the Michael’s I was at. I couldn’t say no!! 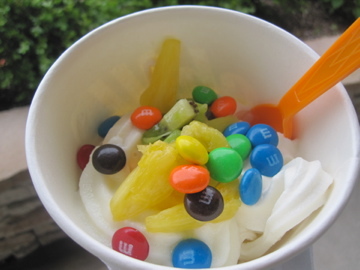 I got a mix of peanut butter, vanilla, cake batter, and tart and topped it with kiwi, pineapple and a sprinkle of m&ms. Fro-yo makes the world a better place. And then I snacked on a bunch of dried mango because my appetite rages the day after I drink. 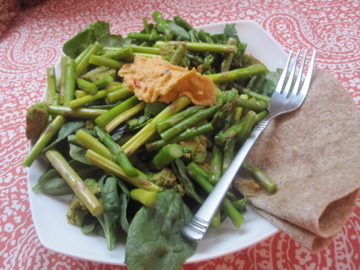 For dinner I had a salad with a base of spinach topped with a Dr. Praeger’s burger, roasted asparagus, and roasted red pepper hummus. Whole Wheat wrap on the side. 4 Chocolates from a box for dessert. Must stop eating now. Eat dinner with my family more: My family and I went out to dinner a few times, but I’m still not eating with them at night much. They eat so late! But I’m going to keep trying. Tell my dad I love him more: I’ve been better about saying it back when he says it to me. Still gotta remember to say it in emails. Visit at least one out of town friend this year: I went to see Mary Cecilia in Savannah! It was so so much fun. You can read about our yoga and pizza making adventures here. Successfully complete my first marathon: CHECK! I ran my first marathon on April 11th in 4:03:31.
focus more on strength training: I’ve been doing a lot more strength training since my marathon. I’m dedicating a day to arms and legs each week and spending at least 30 minutes, compared to my previous 10 to 15. I love feeling strong! Pray every day: My Lenten reflection booklet gave me an A+ in this arena, so I decided to buy a general yearly prayer book to continue after Lent ended. I love starting my morning with a quick reading and it is a sure-fire way to accomplish this goal. be the best where I am RIGHT NOW at work: I’ve made some progress with taking initiative, but I’m starting to get antsy in my position. I’ll be switching jobs in the next few months and I am more than ready for it! Own who I am: Yep. Still not being shy about it. I didn’t make any goals for the year, but I’ve been doing them monthly! 3/4 of my April health goals were met: ran 10 miles a week, drank a TON of water, had a salad for lunch every day (during the week), but didn’t “up” my strength training like I had wanted to…so that goal carries into May! Great job on your goals! You should definitely feel proud of yourself! It’s good to see I’m not the only person who gives up on pumpkin when the weather starts warming up! I just created a Pre-College Bucket List on my blog so I have 50 tasks I plan to accomplish before moving away. Some of them are going to be difficult but as long as I don’t procrastinate I think I got this! That smoothie looks amazing! I’m thinking I might have to crack open a can of pumpkin and get creative with the blender as well! I love that you keep yourself in check with your goals! It’s such a big part of the lululemon culture, so I’m always working towards health, career, and personal goals. There are some I need to work a little harder on, like reading! my appetite is the same way after drinking! the next day I just can’t seem to get food into my body fast enough! i feeel ya! my rents eat SO LATEEEE lke 8 or 9 and its hard to wait to eat with them but soemtime sI jsut sit with them even tho ive already eaten.. its still a great way to interact! i just posted my goals! i did okay last month! Great job on your goals girll— My parents eat crazay late times too it can be anywhere from 6-11. I usually do not waittt because I would rather eat early, but I usually try to hang around when they are having supper to be in on the conversation and what not! PS great job about the marathon, you should be so proud lady! 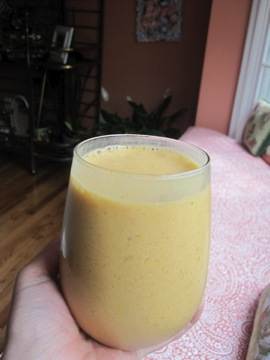 The pumpkin smoothie looked scrumptious! Along with the yogurt masterpiece! You’re so right, fro-yo does make the world a better place 🙂 I love your goals! I agree, eating dinner with family is so important, and I need to make time to do it more. I don’t live with my parents, but we live in the same town – we just need to make the effort to plan. I’m so with you on #8. I feel myself getting better at this every day – but it’s still tough! I love fro-yo with my whole heart! I hav emade a few new goals and one is to eat at least one meal a day completely away from technology and eithe rby myself or with someone I love. It’s totally made a HUGE difference!